EBOVAC1 has published their first report on Phase 1 data in the April 19th 2016 issue of JAMA. The 1st EBOVAC2 Newsletter is available! The first subject was randomized on 10 December 2016 at Makerere University in Uganda. The first subject was randomized at CHU Treichville in Côte d'Ivoire on 26 February 2016. The first subject was randomized at the Centre Muraz, Burkina Faso on the 11th of February 2016. EBOVAC2 and the 7 other IMI-funded Ebola+ attended the Cross-topic EbolA+ meeting organised by IMI on 2 February 2016. The EBOVAC1 & EBOVAC2 joint annual meetings were held in Paris on 20-22 January 2016. The first French subjects were randomized in France on 9 December 2015 at Cochin Hospital and on the 10 December at Henri Mondor Hospital in France. 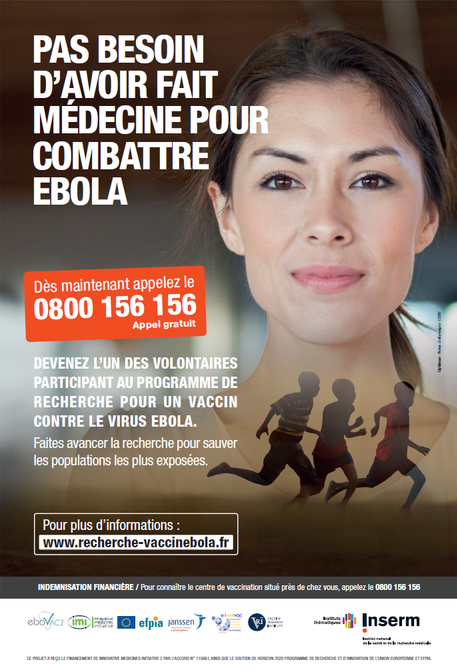 Inserm is recruiting 300 volunteers to test the Ebola vaccine virus as part of Phase 2 trials. For more information, see the press release here. The first volunteer was screened in France on 4 November 2015. More information coming soon. The University of Oxford has started enrolling volunteers into Phase 2 trials. For more information, click here. EBOVAC1 and EBOVAC2 presented a poster on both projects at Targeting Ebola in Paris, France, 28-29 May 2015. Rodolphe Thiébaut, EBOVAC2 coordinator (Inserm), made a presentation on accelerated development of Ebola vaccines. More information. The EBOVAC2 website was launched! The EBOVAC2 grant agreement between IMI2 and Inserm was signed on the 6th of March 2015.